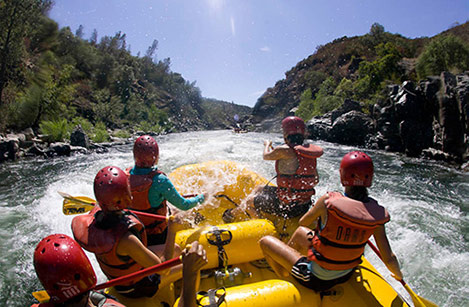 It’s no wonder the South Fork of the American River is one of our nation’s most popular rafting destinations. The river, located in Northern California’s Gold Country, has a guaranteed water flow from Memorial Day through Labor Day and is within a day’s drive of around 40 million people. Location and popularity also result in this being one of the least expensive river rafting trips around, ideal for families who want to experience white water on a limited budget. Rest assured, though bustling Sacramento is just an hour away, the atmosphere on the water is most definitely wild and rural. This is the river where California’s gold rush began and while the crowds of the 1850s are long gone, the hunger for adventure still lingers. The key to any successful rafting trip is a great guide and OARS has been leading top-notch river experiences since their very first dory-navigated trip down the Grand Canyon’s Colorado River in 1969. Since then, their operation has expanded to 19 unique sections of river, thousands of successful trips, and resulted in countless memories being made. One and two-day trips are available on the Class III South Fork, making it the perfect introduction to whitewater. Expect to work up an appetite out on the river; OARS guides always put together a great riverside lunch spread. As a matter of fact, there isn’t much these guides can’t do. My kids absolutely adored Jim, our guide, who kept them safe and entertained and the entire trip. Whether he was pointing out historic mining equipment partially submerged by the side of the river, spying a hawk’s roost, cracking jokes, preparing us a delicious barbecue dinner, or using his eagle eye to read the river, Jim always seemed to be thrilled about sharing the experience with us as we were with him. My daughter had an especially hard time saying goodbye to her newfound hero. After all, he did successfully navigate us through a rapid named Troublemaker! Camping is typically part of the rafting experience and the OARS campground is located right on the banks of the American. The nice thing about camping with OARS is that you don’t even need to bring along your own tent, sleeping bag, or sleeping pads- they have them for rent at a very reasonable rate. Meals, horseshoes, volleyball, riverside fun, and hot showers are all included in the rate. 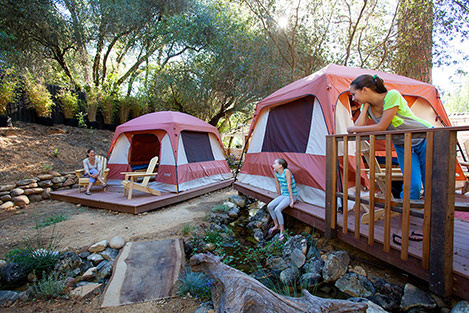 The OARS campground even appeals to the glamping crowd with their new platform tents. My family was über content in the spacious Eureka Copper Canyon tents (the same tent we love and have at home), sleeping off the ground in platform beds with the sound of a rippling stream lulling us to sleep. This is the best option for folks who aren’t really campers but still want to enjoy the complete outdoor experience. If you absolutely can’t stand the thought of sleeping in a tent, there are a couple small hotels nearby as well. With the rafting season just around the corner, I have found myself carrying around my copy of OARS. Adventures Magazine, trying to decide where my family is going to raft next. Amy’s multi-day adventure rafting on Oregon’s Rogue River with her son is at the top of my short list along with the Native American sites and ancient fossils waiting to be discovered on the Green River trip through Utah’s Dinosaur National Monument. Of course, as soon as my kids are old enough my top priority will be rafting the Colorado River through the Grand Canyon, a bucket list-worthy adventure I can’t wait to share with my family. Rafting as a family creates the sort of memories that you sit around on holidays fondly reminiscing about. OARS commitment to safety and family-friendly adventure ensures that these memories will all be positive ones.